Hornbeam is a very useful hedging plant. It is very similar to beech in that it has green leaves in the summer and the dead leaves hang on the hedge for most of the winter. It clips well and makes a solid hedge. The big difference between beech and hornbeam is that unlike beech it will grow on heavy clay soils and does not like light sandy soils. 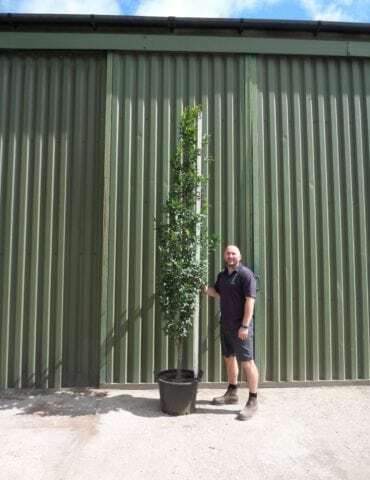 We supply a range of sizes of hornbeam hedging in bare root during the colder months and a range of pot grown hornbeam hedging all year round. Scroll down for more information on hornbeam hedges. Hornbeam is also known as Common Hornbeam (Carpinus betulus). Why should I plant a hornbeam hedge? Hornbeam is a native deciduous tree to the UK. 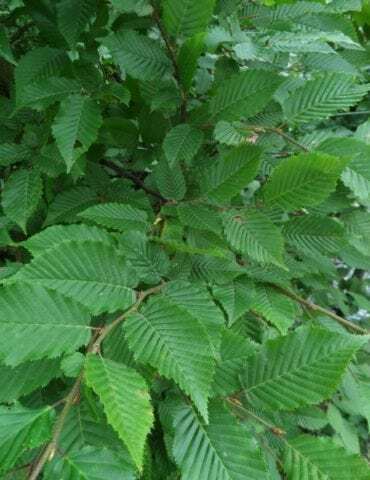 It is very similar to beech and is a traditional form of hedging found across the country and its rounded and serrated ribbed green leaves are synonymous with the arrival of spring. Unlike some of its competitiors, hornbeam leaves will remain on the tree for most of the winter in their golden-copper state and look highly attractive and some people prefer this as a true evergreen alternative. As well as being a haven for wildlife and nesting birds, hornbeam is suited to many soil types and is much more tolerant of wetter sites than beech. Hornbeam can be grown as fine trees and are found in many of the UK’s woodlands, many being very ancient and of a great height. That being said, they respond extremely well to clipping and hedgemaking, making them one of the most popular choices for hedges in this country. Hornbeam respond well to regular clipping and grow and thicken out slightly faster than beech. Most hornbeam hedges tend to be around 6-7ft in height to give eye level privacy and can be grown taller if required. How quickly will a hornbeam hedge grow? Hornbeam hedging grows relatively quickly and one can expect 1.5ft (45cm) per year after planting. However, once the hedge has reached its desired height it should be trimmed at that height accordingly to maintain its size and density. This will slow down the upward growth of your hedge to a much more manageable level meaning it can easily be trimmed once a year. When should I clip or trim a hornbeam hedge? A hornbeam hedge will need to be clipped annually in the Spring or Autumn as you would with any other hedge. If trimming in the spring, be careful to avoid the bird nesting season. How far apart should I plant a hornbeam hedge? 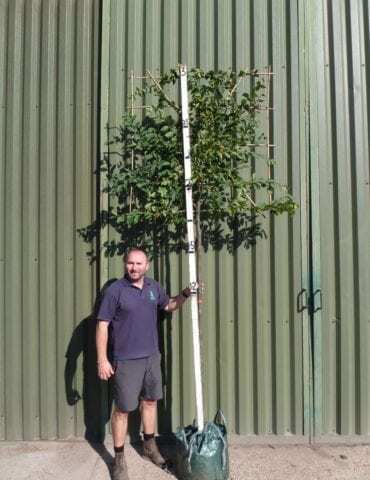 Hornbeam should be planted 1.5ft (45cm) apart in a single row or alternatively 2ft (60cm) apart in a double row and careful preparation of the planting site is important. See section below on how to look after your hornbeam hedge after planting. How do I look after my hornbeam hedge after planting? Although hornbeam plants will put up with most soil types (apart from particularly dry ground), we recommended that the planting soil is mixed with compost to give the plants the best environment to grow in for their first year. 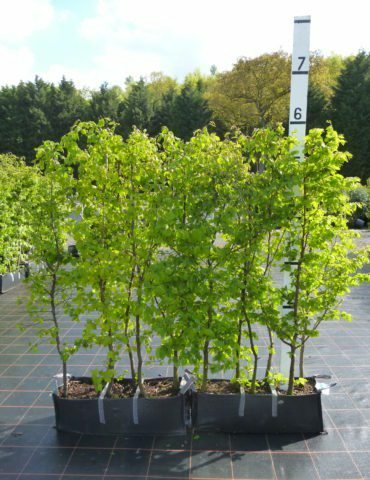 If you are planting bare-root hornbeam hedging plants, we also recommend using Rootgrow which helps the plants produce a secondary root system after planting to give the best chance of successful establishment. After planting, your hornbeam hedge should be watered regularly during its first year to give it the best chance of survival and this is especially important if your hedge is being planted in the drier summer months. How do I water my hornbeam hedge? Watering a hornbeam hedge is especially important if you are planting during the summer or a dry period. For watering, we recommend using leaky hose (sometimes described as porous pipe) which can be connected to your existing hose pipe and will slowly leak water onto the roots of your hedge in a controlled manner to ensure that it soaks in and your hedge becomes properly watered. Leaky hose is cheap, easy to install and very effective. See our Accessories page for more details on leaky hose. 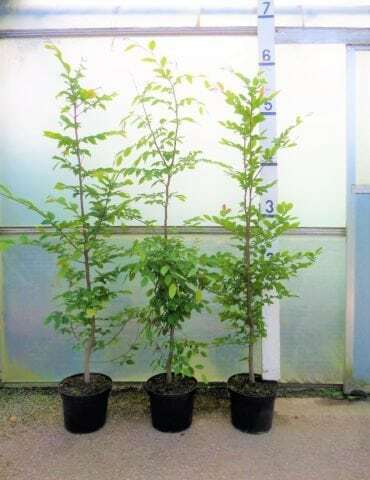 Is hornbeam tolerant of different soil types? Hornbeam will thrive in most soil types (including heavy clay) but do not like being in especially dry ground, for which beech is better suited. Does hornbeam like full sun or shade? Hornbeam will grow extremely well in full sunshine or partial shade. 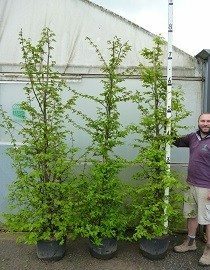 We usually stock a large selection of different sizes of hornbeam throughout the year. 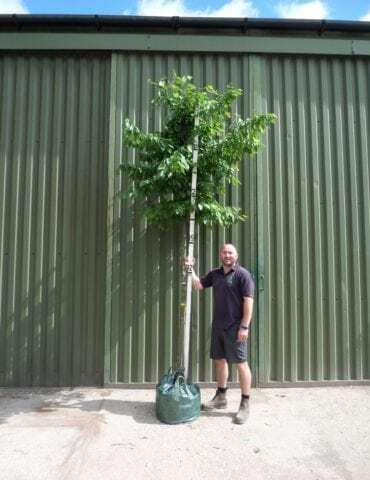 In the winter we stock a range of bare root hornbeam hedging which provides a cost effective solution to planting a hornbeam hedge and all year round we supply a range of pot grown hornbeam hedging which can be planted in the drier months if properly watered.